Rather simply waxing poetic about my favorite team, I will validate the claim that the Minneapolis- Los Angeles Lakers are the greatest franchise in the history of the NBA, and perhaps all of professional sports. In 62 seasons, the Lakers have made 57 postseason appearances, had 50 winning seasons and have only missed the playoff twice in the same decade once- when they missed consecutively in 1974-75 and in Kareem’s first season with the team, 1975-76 (despite having four more wins than the Pistons, who made it out of the Western Conference’s other division). The franchise that came into existence in 1948 as the Minneapolis Lakers won a championship in its first season. Over the next five seasons, the last of George Mikan’s great career, he and fellow great Jim Pollard were joined by future Hall of Famers Vern Mikkelsen, Slater Martin and Clyde Lovellette, as the Lakers won another four championships. With Mikan gone, the Lakers were absent from the NBA Finals for each of the next four seasons and missed the playoffs in 1957-58, with a league-worst 19-53 record. It would be almost two decades before either of these things would happen again. In the 50 years since the NBA expanded to an 80-game (now 82-game) schedule, the Lakers have won 50+ games in a season 31 times and 60+ on 11 occasions. The rest of NBA history has seen 52 60-win teams. In 62 seasons, the Lakers have advanced as far as the conference finals 42 times. They have participated in exactly half of the last 62 Finals series, including 10 of 15 from 1958-72 and nine of 12 between 1979 and 1991. The Lakers have won 16 championships- second all-time to the Celtics’ 17- but hold a 11- 6 edge over the past 40 years, 10- 4 since 1980 and 5- 1 since 1990. Sustained excellence? Thy name is the Lakers. As for star power and individual greatness, there’s been a steady stream of that too. A total of 101 players have suited up in at least 300 games for the Lakers. Of this group, 13 are in the Hall of Fame. This number is guaranteed to hit 15 exactly five years after the respective retirements of Shaquille O’Neal and Kobe Bryant. Additionally, Pau Gasol looks like a decent bet to push that total to 16 by the time he’s finished. The flow of superstars into Lakerland through the years is staggering. From Mikan, Pollard, Mikkelsen and Martin in the 1940s and 1950s, to Elgin Baylor, Jerry West, Gail Goodrich and Wilt Chamberlain in the 1960s and early 1970s, to Kareem for a decade and a half starting in the mid-1970s. At the tail end of the West-Wilt-Goodrich era- right after Elgin Baylor’s retirement- the 1971-72 Lakers produced one of the greatest season in NBA history. They posted a regular season record of 69-13, including an unfathomable 33-game winning streak, and cruised through the playoffs to secure the franchise’s first championship in Los Angeles. As Kareem rounded out his prime, he was joined by the greatest point guard of all time, Magic Johnson. They were joined under super-coach Pat Riley by underrated two-guard Byron Scott and James Worthy, one of the most well-rounded offensive weapons of the era. Together, they formed the foundation for the spectacular 1980s Showtime teams. After a relative drought for a good chunk of the 1990s (Cedric Ceballos, Nick Van Exel and Sedale Threatt figured prominently), the Lakers struck gold again. In the summer of 1996, legendary-player-turned-legendary-GM Jerry West landed all-universe free agent Shaquille O’Neal and traded for 17-year-old preps-to-pros stud Kobe Bryant. Under uber-coach Phil Jackson, the pair would return the Lakers to the NBA’s elite, winning three straight championships and become one of the greatest duos in NBA history. However, tension between the superstar duo, who’d never particularly cared for one another, boiled over after an embarrassing Finals loss to the Detroit Pistons in 2004. That they lost was not embarrassing- the Pistons were really good- but the way in which the wheels came flying off is another story. Once it was clear that the two could no longer coexist, Shaq was sent to Miami in a deal that brought Lamar Odom and Caron Butler to L.A.
A season of future All-Star Caron Butler emerging as a potential running mate for Kobe. The subsequent trade of Butler to Washington for human cataclysm, Kwame Brown. A return to the playoffs after just one trip to the lottery. Kobe’s “81” amid just the third 35+ ppg season in 35 years. A heart-stopping trade demand from Kobe Bryant. The return of Phil. The arrival of Pau Gasol in exchange for Kwame Brown (Kwame’s lone contribution to NBA history) and Pau’s extremely talented younger brother. The return of D-Fish. A return to the Finals in 2008. A 1960s-esque loss to Celtics upon arrival. A return to glory with another pair of titles, including sweet vindication against the Celtics. It’s fitting that the Forum (later the Fabulous Forum and the Great Western Forum), no longer a basketball venue, was sold to a local church group and is now a house of worship. WARNING! This is NOT light reading! No player in NBA history has better personified a city, a team and an era than Magic Johnson did with the Los Angeles Lakers in the 1980s. Magic is not only the greatest point guard of all time, but also as great a combination of style and substance as the NBA’s ever seen. In the purest sense of the word, Magic Johnson is a basketball genius. No player before, or since, has elevated the team game to an art form in the way that he did. In a city with an insatiable appetite for entertainment and bursting at the seams with star power, Magic Johnson owned Los Angeles during its most electric decade. That he was the greatest statistical wonder since Oscar Robertson was secondary. What captured the collective heart of Los Angeles was the way that Magic used his otherworldly passing skill in combination with an almost creepy sense for exactly where everyone else was on the floor, and where they’d be in a few seconds. No one who’s seen a Lakers games from the early-to-mid-1980s will forget the way he’d grab a defensive rebound, turn upcourt, turn on the jets and get from foul line to foul line in about five strides, with reinforcements, usually in the form of Byron Scott and James Worthy, on the wings. It’s silly to try to describe exactly how Showtime would go about punctuating a fast break (for an idea, check this out). However, it is safe to say that at its best, Magic’s crew took uptempo basketball to its highest elevation. Turning to the specifics of Magic’s epic career, it’s hard to sum up the man’s body of work. 10 All-Star selections (MVP in 1990 and 1992), nine straight First Team All-NBA selections, three league MVP awards and the best job of stuffing the box score since Oscar Robertson. As a 20 year-old rookie in 1979-80, Magic averaged 18 ppg, 7.7 rpg, 7.3 and 2.4 spg. In 1981-82, he put up the greatest all-around season of the past 45 years, averaging 18.6 ppg, 9.6 rpg, 9.5 apg and 2.7 apg in 78 regular season games. For reasons that defy explanation, he was not named an All-Star. The worst of his first five seasons as a pro? 1982-83, when he put up 16.8 ppg, 8.6 rpg, 10.5 apg and 2.2 spg. Magic averaged at least 10 apg in each of the nine seasons from 1982-83 through 1990-91, topping 12 apg six times. For eight straight seasons beginning in 1983-84, Magic was good for at least 17.6 ppg, 5.9 rpg (7+ three times) and 11.5 apg. In Magic’s first MVP season, 1986-87, the year in which he was at the peak of his powers, he averaged 23.9- 6.3- 12.2. Two years later he put up 22.5- 7.9- 12.8 in capturing his second MVP trophy, and followed it up in 1989-90 with 22.3- 6.6- 11.5 and a third MVP nod. As amazing as he was in the regular season, it was in the postseason that Magic truly built his legend. Magic quarterbacked the Lakers to an incredible nine conference titles in 12 years, and collected five championship rings in the process. In 190 career postseason games, Magic Johnson averaged 19.5 ppg, 7.7 rpg and 12.3 apg. As the aforementioned 20 year-old rookie, Magic put up 18.3 ppg, 10.5 rpg, 9.4 apg and 3 spg in the Lakers’ 16-game title run. He highlighted his all-around brilliance in Game 6 of the 1980 Finals. With Kareem Abdul-Jabbar nursing an ankle injury in Los Angeles, Magic led the Lakers into Philadelphia’s Spectrum, where he started at center in place of the Captain, played every position on the floor and produced a 42- 15- 8 as the Lakers captured the title. For nine straight postseasons starting in 1983, Magic averaged no worse than 17.4 ppg and 11.8 apg. In the first of those seasons- which ended with his second championship- he averaged 17.4 ppg, 11.3 rpg and 9.3 apg. In 1985, as the Lakers exorcised a quarter century worth of demons and captured a title on the Boston Garden parquet, Magic put up an equally silly stat line, averaging 17.5 ppg, 7.1 rpg and 15.2 apg in 19 postseason games. All this, and we still haven’t touched on Magic’s exceptional performances at “winnin’ time” (Baby Sky Hook, anyone? ), his innate ability to command the game every second he was the floor or the fact that he was the engine that drove the 1987 and 1988 Lakers to become the first back-to-back NBA champions in two decades. It’s impossible to accurately sum up Magic Johnson’s legacy in a couple of pages. It would take an entire book to do the job properly (here’s hoping!). However, suffice it say that from any perspective- individual or team, style or substance- Magic Johnson is a player the likes of which basketball has only seen once, with a place in NBA history that’s been reached by only a select few. A pair of guys who, while enjoying none of Magic’s individual brilliance, do share his knack for accumulating championship rings head the next tier of Lakers’ point guards. With nine championships between them, Derek Fisher and Hall of Famer Slater Martin were half a century apart in running the point for the Lakers, but their contribution to the Lakers are similar- hard-nosed defense, unselfish play and the ability to defer to superstar teammates. Slater Martin spent his first seven seasons with the Minneapolis Lakers after joining the franchise in its second season. He averaged 9.9 ppg and 4.1 apg and played outstanding perimeter defense in 484 games with the Lakers. After playing a minimal role in the team’s title in his rookie year, in 1951-52 he combined with George Mikan, Jim Pollard and Vern Mikkelsen to win three straight championships. Martin was named an All-Star each of his last four seasons with the Lakers. His last two years with the franchise, during which he averaged 13.4 ppg, 3.6 rpg and 6 apg, were the best of his 11-year career. Similarly, Derek Fisher has provided the Lakers with toughness and leadership over 11 seasons, helping Kobe Bryant and Shaquille O’Neal realize their championship dreams. Like Martin, Fisher’s stat line won’t blows you away (8.1 ppg, 3 apg in 790 games), but his perimeter defense (maybe the best ever at drawing charges) and timely offense (10+ ppg in four of five title runs) have helped the Lakers capture five rings since 2000. Not only has Fisher been a solid contributor, he’s produced more than his share of signature moments. As the Lakers clinched the 2001 title in Game 5, he was outstanding, scoring 18 points, making six of eight 3-pointers and literally “shushing” the Philly crowd. In San Antonio in the 2004 conference semifinals, he delivered the shot that’s come to be known as “0.4.” In Game 4 of the 2009 Finals, with Orlando poised to even the series, Fisher hit a pair of massive 3-pointers- one to sent the game into overtime and another to seal a victory. Finally, in 2010, with the Lakers having already squandered home court advantage and the Celtics about to take Game 3, Fisher saved the day. Again and again and again. He scored 11 MASSIVE fourth quarter points and burst into tears in a postgame interview that Laker fans will not forget. Meanwhile, off the floor, his contribution’s been ever greater. As Shaq and Kobe feuded, locker room factions formed behind each superstar. Derek Fisher remained the team’s mature leader. More recently, when he rejoined the Lakers after three years away, Fisher did so with the team in disarray and with Kobe Bryant demanding to be traded. As he’s done so often in the past, Fisher held the team together and served as a bridge between Kobe and his teammates. In times of turmoil (and there have been plenty), Derek Fisher has been the Lakers’ rock. Also deserving a shout out here is Norm Nixon, who averaged 16.8 ppg, 7.9 apg and 1.8 spg in six seasons with the Lakers. Nixon put up at least 17- 8 three times and earned the first All-Star selection of his career in 1982. After starring for two seasons prior to Magic’s arrival, the pair combined to make up the starting backcourt of Showtime’s first two title winners (1980 and 1982). In 58 postseason games with the Lakers, Nixon averaged 17.7 ppg and 8 apg, including a career-best 20 ppg, 8 apg performance during the championship run of 1982. As a great as the Lakers have been at center throughout their history, the two-guard spot is every bit it’s equal, headed by two of the three best to ever play the position. Like many of the greats from his era, Jerry West played a game that was ahead of its time. West was one of the NBA’s first combo guards, with ballhandling and passing skills that would have landed him in the Hall of Fame as a point guard and an offensive skill set that ranks among the greatest ever among perimeter players. He could penetrate. He could stop on a dime and release a beautiful mid-range jump shot before most defenders could react. During his 14-year playing career with the Lakers, West earned his career with 14 All-Star selections (MVP in 1972), 10 All-NBA First Team selections and a pair of Second Team nods. He is the third player in history to reach 25,000 points (after Wilt Chamberlain and Oscar Robertson). He retired with 25,192 points (2nd in Laker history), 6,238 assists (2nd in Laker history) and 5,366 rebounds in 932 games. He retired with career averages of 27.0 ppg (6th all-time, tied with Shaq for 2nd in Laker history), 5.8 rpg and 6.7 apg. He led the Lakers in scoring seven times (Elgin Baylor topped him four times in the 1960s and Gail Goodrich three times at the end of West’s career). Four times in his career West averaged 30+ ppg, five times he grabbed 6+ rpg and nine times he averaged 6+ apg. In 14 seasons, with the Lakers, Jerry West appeared in the Finals nine times, cashing in on his eighth trip in 1972, after seven heartbreaking losses to Celtics in the 1960s. Two of the fives times his teams failed to reach the Finals, 1967 and 1974, West was unable to play more than a single postseason game due to injury. Seven times Jerry West averaged 30+ ppg in a postseason, including an awesome 40.6 ppg in 11 games in 1965. In the 1969 Finals, West became the only player ever to win Finals MVP in a losing effort, averaging 38 ppg and posting a 42- 13- 12 in a brutal 108-106 Game 7 loss. In 153 career postseason games, West averaged 29.1 ppg, 5.6 rpg and 6.4 apg. Only Michael Jordan has a higher career postseason scoring average (33.5 ppg) than Jerry West. He played defense as hard as he played offense. West’s quickness and incredible instincts made him perhaps the best man-to-man defender of his era. Also, while stats were not kept on steals and blocked shots until his final season, West is widely regarded as one of the elite ball hawks and shot blocking guards in NBA history. The All-Defensive Teams were introduced in 1969, his 10th season. West made every one of them until he retired in 1974. West’s intensity, dedication and toughness are also nothing short of legendary. West possessed a tireless work ethic, never allowing himself to be content with his own greatness, and was totally obsessed with working to improve his game. West once said of himself, "I'm surprised when the ball doesn't go into the hoop… I think I should make every shot." After the Lakers' heartbreaking loss to the Boston Celtics in the 1969 NBA Finals, Celtics’ legend John Havlicek walked up to West and said, "Jerry, I love you." On "Jerry West Night", and eleven-time NBA champion and Lakers’ rival Bill Russell (whose team held a 7-0 Finals record against West’s) said, "Jerry, you are, in every sense of the word, truly a champion… If I could have one wish granted, it would be that you would always be happy." Jerry West is the greatest shooting of the pre-Jordan NBA, the Logo, and forever one of the greatest players in NBA history. A quick note for anyone that owns the Celtics’ Dynasty Series DVDs: watch Jerry West in the fourth quarter of Game 7 of that 1969 Finals series. MJ and Kobe have nothing on this guy. Whichever of these two didn’t get the nod here was going to be the toughest snub in this entire series. In this case, it’s Kobe Bryant. Whatever your thoughts on Kobe Bryant, there’s no denying that he’s as compelling a personality as the NBA’s seen in a long time. There’s a phenomenal book to be written about the second greatest (when it’s all said and done) two-guard in NBA history (Kobe, if you’re reading this, I’d be more than happy to write it). I will attempt to summarize this future book in a few hundred words. For the purpose of this exercise, Kobe’s status as the most polarizing player in NBA history will for the most part be set aside. In many ways, Kobe Bryant is extremely similar to Jerry West. No task on a basketball court is beyond his ability- at either end of the floor. He’s hypercompetitive, sometimes to the point of detriment. Finally, Kobe shares Jerry West’s work ethic, a single-minded obsession with polishing and fine-tuning his already otherworldly game in the pursuit of perfection. When he entered the league at age 17 out of high school, Kobe Bryant was a freakishly gifted athlete a very skilled basketball player. However, he had little in the way of a refined game. In nearly a decade and a half since (you feel old reading that? I feel old writing it!) he’s developed the deadliest mid-range game since Michael Jordan, he’s become a threat from 3-point range (and is tied for the most “3s” ever made in a game, with 12), he evolved into one of the NBA’s best perimeter defenders (All-Defensive First Team eight times), has worked with Hakeem Olajuwon to expand his low post game and has become an extremely effective rebounder (his Game 7 performance was the rebounding equivalent of a 40-point game). On top of all that, there’s his uncanny ability to deliver in “winnin’ time”- late in close games and in the postseason. Kobe is the best crunch time player since MJ, bith in the regular season and the playoffs. In an annual survey of NBA general managers, Kobe’s regularly selected as the player they’d most want taking a game-deciding shot. The Lakers have reached the postseason in 13 of his 14 seasons, advancing to the NBA Finals seven times. Five of those seven trips have ended in a championship, three straight from 2000-02 (w/ Shaq) and the two most recent (2009-10), with Kobe claiming Finals MVP in both. In a staggering 198 postseason games (4th all-time), Kobe’s averaged 25.5 ppg, 5.2 rpg and 4.8 apg. He’s scored 5,049 postseason points, which is 82 behind Shaq for third all-time. Kobe has been named an All-Star 12 of 13 possible times (no game in 1999) and has won three All-Star MVPs. He’s been selected to the All-NBA First Team eight times, the Second Team twice and was named league MVP in 2008 (no way he shouldn’t have won it in 2006 as well!). All this, and he’s still just 32 years old- though I must acknowledge that his is perhaps the oldest 32 in NBA history. However, given his exceptional physical gifts and tireless work ethic, Kobe’s far from done building his resume. If he hasn’t already done it, at some point before his retirement, Kobe Bryant will establish himself as one of the five greatest players ever to take the floor in the NBA. In most NBA circles, a three-time champion and 15+ ppg on some of history’s best teams, coupled with the primes years of a Hall of Fame career- including a major role on a 69-win champion with a 33-game winning streak- would constitute a very strong two-guard spot. However, in Lakerland Byron Scott and Gail Goodrich round out the two-guard spot and are just a pair of blips on the radar. Heading up the next tier of Lakers’ two-guards is Gail Goodrich. 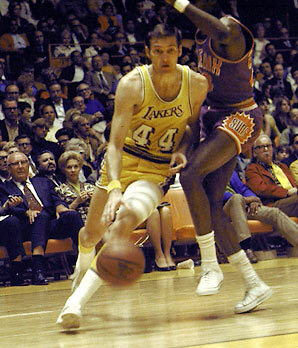 The 10th pick in the 1965 draft, Goodrich spent three unspectacular seasons with the Lakers before he was lost to the Phoenix Suns in the 1968 expansion draft. In Phoenix he exhibited the outstanding scoring that would be his calling card and was reacquired by the Lakers in a trade (for backup center Mel Counts) in 1970. After returning, Goodrich led the Lakers in scoring in five times (1971-75), averaging at least 22.6 ppg each season. Goodrich was the top scorer on the 69-win, 1971-72 championship team. That year he averaged a career best 25.9 ppg and earned his first All-Star selection as a Laker. He was named an All-Star in each of the next three seasons as well and earned the only All-NBA First Team selection of his career in 1973-74, when he averaged 25.3 ppg (fourth in the NBA) and 5.2 apg. 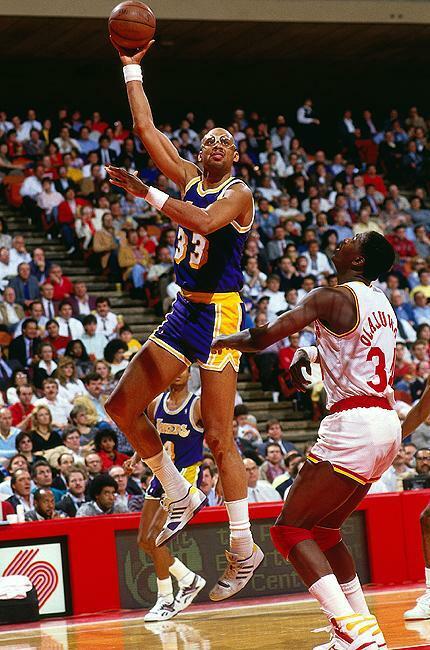 Goodrich remained with the Lakers until the 1975-76 season, Kareem Abdul-Jabbar’s first with the team. He then signed with the New Orleans Jazz, with whom he’d spend his last three seasons. At the time of his retirement in 1979, Goodrich was 11th all-time in scoring and 10th all-time in assists. In Laker history, he still holds a spot in the top 10 in points (13,044; 6th), assists (2,863; 8th) and scoring average (19 ppg; 9th). As great a player as Gail Goodrich was for the Lakers in the 1970s, his greatest impact on the franchise is something over which he had no control. As a result of losing Goodrich to free agency, the Lakers were entitled to compensation. The Jazz agreed to send its top pick in the 1979 draft and a pair of other first-rounders to the Lakers. The Jazz finished the 1978-79 season with the worst record in the NBA, ensuring the Lakers a top-two pick, to be determined by a coin flip. The Lakers won the coin flip against the Chicago Bulls, and with it the right to select Magic Johnson. Beginning a few years after Goodrich’s exit, Byron Scott spent his first NBA decade with the Lakers, with much of that time spent as Magic Johnson’s backcourt running mate. In 846 regular season games, Scott averaged 15.1 ppg,, and he was just as good in the playoffs, averaging 15.3 ppg in 142 postseason games. He averaged 17+ ppg three times and peaked as an individual player in the Lakers’ 1987-88 “Back to Back” season, when he averaged a team-high 21.7 ppg, along with 4.1 rpg and 4.1 apg. In the team’s 24-game title run, Scott averaged 19.6 ppg, 4.2 rpg and shot the ball extremely well (50- 87- 44 from FG- FT- 3-pt). His is never the first name that comes to mind, but Byron Scott was one of the most important members of the Showtime era. I can’t believe it’s not Worthy. I really can’t. and I wrote this. However, the more I researched this, the tougher it was to deny an original Laker and one of the best and players of his time. Jim Pollard was the first great forward in franchise history and perhaps the best forward of his era. In an era not noted for exceptional athleticism, Pollard was an anomaly. Before there was ever a Billy Cunningham, Pollard was known as the “Kangaroo Kid” because of his occasional propensity to dunk from the free throw line during warmups. This is documented, although unfortunately no video exists. In addition to his athleticism, Pollard was one of the most skilled players of the NBA’s early days. He was a Laker from Day One and spent his entire career with the franchise. Along with Mikan, Pollard is the only member of all six (one in the NBL in 1948) Minneapolis title teams. Pollard scored in double-figures in all seven of his seasons, was named All-NBA First Team twice, earned four All-Star selections (there was no All-Star Game his first two seasons) and was the leading scorer in the 1954 game with 23 points. Jim Pollard averaged 13.2 ppg, 7.8 rpg (in 319 games with rebounding stats) and 3.2 apg in 438 games as a Laker. In 62 postseason games over six years for which stats exist, Pollard averaged 13.7 ppg, 8.1 rpg and 3.5 apg. He was inducted into Basketball’s Hall of Fame in 1978. With all due respect to Big Game James, Jim Pollard reached great heights during his playing days and is one of the NBA’s trailblazers. However, Worthy was a perfect player for the teams on which he thrived. His offensive versatility seemingly had no bounds- Worthy could finish with either hand, had 18-foot range, a great turnaround jumper and possessed one of the great first steps (especially turning baseline) in NBA history. And then there was the fast break. While there’s no doubt that Worthy was lucky to be teamed with Magic Johnson, there’s a strong case to be made that that Magic was as lucky to have James Worthy at his side. At 6’9” and with the ability to run like a thoroughbred, Worthy was the perfect complement to Magic Johnson on the legendary Showtime fast break. Worthy spent 12 seasons with the Lakers and earned seven straight All-Star selections (1986- 92), averaging 19+ ppg in each of those seasons. In each of his first eight seasons, Worthy shot at least 53% from the field (57% three times) and averaged 5+ rpg each season (this is more impressive when you consider Kareem, Magic, A.C. Green and Kurt Rambis were also crashing the boards). James Worthy also raised his game as the stakes went up, averaging 21.1 ppg, 5.2 rpg and 3.2 apg in 143 career postseason games. It’s worth noting, however, that he wasn’t always Big Game James. In his second pro season, at the Boston Garden in Game 2 of the 1984 Finals, Worthy threw an ill-advised cross-court pass that was picked off by the Celtics’ Gerald Henderson, who hit the game-tying bucket. The Lakers lost the game in overtime, and ultimately lost the series in seven games. This could have Worthy’s catastrophic “Nick Anderson” moment. However, in a Finals rematch the following spring, Worthy and the Lakers returned, seeking redemption. They both found it, as the Lakers took down the Celtics for the first time in eight Finals meetings- on the Boston parquet no less- with Worthy averaging 23.7 ppg in the series. He and the Lakers reached the Finals four times in the next six years, capturing another two titles. The greatest showing of Worthy’s outstanding postseason career came in 1988. As the Lakers looked to become the first team in 20 years to repeat as champions, Worthy’s cemented his reputation as Big Game James. In a hard-fought seven-game series against Detroit’s Bad Boys, Worthy put up 22 ppg, 7.4 rpg and 4.4 apg and was the key to the Lakers overcoming a 3-2 deficit in L.A. He scored 28 points and grabbed nine rebounds in a one-point Game 6 win and put an exceptional 36-point, 16-rebound, 10-assist exclamation point on Game 7, locking up the Finals MVP award in the process. Pollard and Worthy are joined here by a talented and extremely decorated crew that spans several Laker generations. First up is one of the best frontcourt scorers in franchise history, Jamaal “Silk” Wilkes. After winning a Rookie of the Year award and a championship in his first three seasons with the Golden State Warriors, Wilkes signed with the Lakers as a free agent in 1977. Wilkes spent eight seasons with the Lakers, averaging at least 17.6 ppg and shooting better than 50% in each of his six healthy seasons. Wilkes scored 20+ ppg in three straight seasons (1979-82) and earned three All-Star selections (1980-83) as a Laker. In 575 games as a Laker, Wilkes averaged 18.4 ppg, 5.4 rpg and shot 51.6% from the field. Additionally, he was a key component of the championship teams of the early 1980s, averaging 20+ postseason ppg for both the 1980 and 1982 title winners. Next up is the owner of the 77th highest scoring average by frontcourt player in Lakers history, Robert Horry. In 448 games with the Lakers, Horry averaged 6.3 ppg, 5.5 rpg and shot 42.1% from the field. And the numbers don’t portray as a much more effective postseason player. Oh how wrong the numbers are! Despite barely averaging three buckets per game, Robert Horry forever has a place on this list and in Lakers history. Why? Because seemingly any time the 2000-02 Lakers needed saving, Horry was there to bail their collective a$$ out of trouble. Game 3, 2001 Finals, in Philadelphia: having already surrendered home court, the Lakers were locked in a tight battle with the Sixers. With Shaq having fouled out and L.A. clinging to a one-point lead, Horry nailed a 3-pointer from the corner (his third without a miss) with under a minute left, and made four straight free throws in that final minute to seal the win. Game 4, 2002 Western Conference Finals, in Los Angeles: already down 2-1 to an outstanding Kings team and staring down the barrel of backbreaking 3-1 deficit, Shaq and Kobe both miss layups in the game’s dying seconds. With two seconds left, Vlade Divac knocks the ball away to kill the clock. Not so fast! The ball bounces right to Horry, who, in rhythm, steps into a game/season/dynasty-saving 3-pointer that gave the Lakers a 100–99 win. Finally, a quick shout out to Lamar Odom, the only non-Kobe constant of the post-Shaq era, and the third best player on a pair (and counting) of championship teams. Early in his career, Odom rightfully took plenty of heat for inconsistency and immaturity. However, he’s not only overcome those issues, he’s emerged as a solid veteran on championship teams, willing to do whatever is needed to win games. He comes off of the bench without complaint. Need him to run the point for a while? He’s there. A few minutes in the middle? You got it! Lamar Odom’s not only averaged a solid 13.5 ppg, 9.6 rpg and 3.9 apg in 437 games over six seasons as a Laker, he’s also grown up and matured into a champion. Many players are credited with revolutionizing the NBA game. Elgin Baylor was among the first. Before Julius Erving and David Thompson took the game above the rim, Elgin Baylor got it off of the ground. Not only was he a fantastic mid-range shooter and an excellent rebounder and passer, Baylor introduced the NBA to a gold mine of offensive moves. He used his jumping ability and hang time on jump shots, to outlast would-be defenders. He was elusive on the baseline, using his speed and power to get past defenses. In the paint, Baylor had an arsenal of reverse layups, double-clutches and an exceptional running bank shot. However, Baylor’s role in furthering the style of the on-court game is secondary to his biggest contribution to NBA history- saving the Lakers franchise. After a brilliant collegiate career in which he averaged 31.3 ppg and led the University of Seattle to the 1958 NCAA title game, Baylor joined the Minneapolis Lakers as the top pick in the 1958 draft. In the aftermath of the George Mikan era, the Lakers were suffering, both on the floor (19-53 in 1957-58) and with flagging ticket sales. Thus, the team used the top pick on Baylor and convinced him to forego his last year of college. That Baylor averaged 24.9 ppg, 15 rpg, 4.1 apg, won Rookie of the Year, was named both an All-Star and All-NBA First Team and led the Lakers to the NBA Finals was all something of a bonus… to the mere fact that he agreed to join the Lakers at all. In 1971, according to then-owner Bob Short, "If he [Baylor] had turned me down then, I would have been out of business. The club would have gone bankrupt." Now that he’d singlehandedly altered the future of the NBA, it was time for Elgin to really get to work. After a fantastic second season (29.6- 16.4) in 1959-60, Baylor and the Lakers relocated to Southern California. Now flanked by Jerry West, Baylor took his game to new heights In the Lakers’ first three seasons in L.A., Baylor would average no worse than 34 ppg and 14.3 rpg and helped lead the Lakers to a pair of Finals appearances, both of which, again, resulted in losses to the Celtics. In 38 postseason games during this run, Baylor averaged 36.4 ppg and 15.5 rpg. Despite falling short of the ultimate prize during this stretch, Elgin Baylor turned in perhaps the most impressive individual season in NBA history in 1961-62. That season, he averaged 38.3 ppg (highest ever among players not named Wilt), 18.6 rpg and 4.6 apg in 48 games. Given his limited time on the floor, it’s easy to dismiss this as a great season cut short by injury or suspension. So why did Elgin take part in only 48 games that year? An Army Reservist, Baylor was called into active duty during the season and stationed in Washington State. He was only granted a weekend pass, meaning he could only take part in games played on weekends. He would join the Lakers wherever they happened to be each weekend, before returning to Washington. Oh! And all of this happened during segregation. Even if you already knew that story, please read it again. Thanks. Starting in 1963-64, Baylor began to suffer from the knee problems that would ultimately end his career, and his averages fell to 25.4 ppg (a five-year low) and 12 rpg (a career-worst to that point). Baylor would average at least 24 ppg and 9.6 rpg (12+ three times) in six of his last seven seasons before retiring nine games into the 1971-72 season. Baylor remains one of the NBA’s greatest ever all-around forwards. He retired with 23,149 points (27.4 ppg, still fourth all-time and first in Lakers’ history), 11,463 rebounds (his 19.8 rpg in 1960-61 is the most ever for someone sub-6’8”) and 3,650 assists over 846 games. 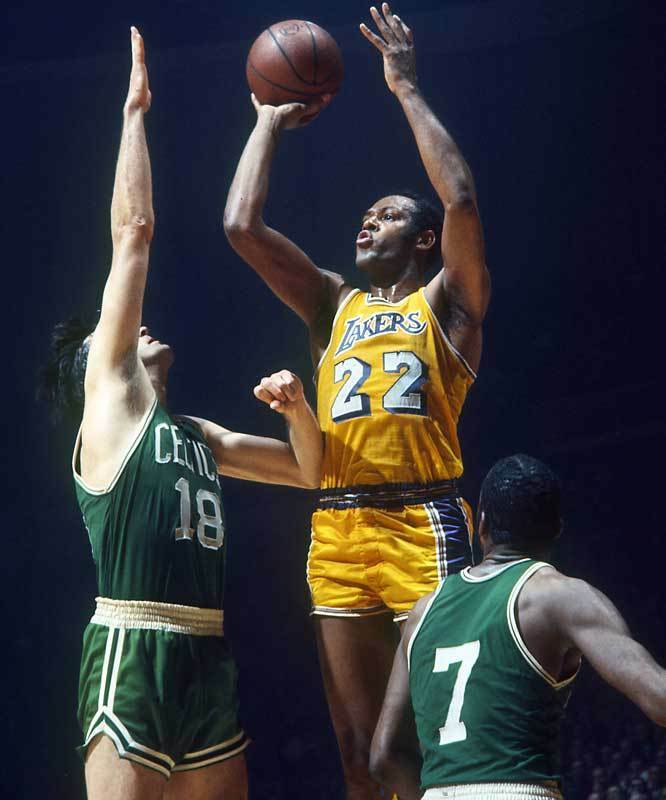 During his career, Elgin Baylor earned 10 All-NBA First Team selections, 11 All-Star selections, seven Finals trips, had postseason averages of 27 ppg and 12.9 rpg and an average of 26 ppg in 44 Finals games. He still holds the NBA Finals game record for most points in a game with 61, which came in a 126-121 win in Game 5 of the 1962 Finals against Boston. Earlier in this series, I identified Nate Thurmond as one of the NBA’s “Hard Luck All-Timers.” Well, it’s time for Elgin Baylor to lay claim to that throne. As previously mentioned, Baylor retired nine games into the 1971-72 season. With Happy Hairston (15.2 ppg, 12.4 rpg in 394 games with the Lakers) starting in his place, the Lakers won their first game after his retirement. And the 32 after that. Yep, Elgin’s retirement marked the beginning of the Lakers’ 33-game winning streak. This is a record that still stands today, not only in the NBA, but all of professional sports in America. The 1971-72 Lakers went on to post a 69-13 record (an NBA record for 25 years) and win the championship that eluded Baylor in his eight trips to the NBA Finals. Coming in second here is Baylor’s predecessor in Minneapolis, Vern Mikkelsen. He spent his entire 10-year career with the Lakers, where he teamed with Mikan, Martin and Holland to win four championships. In 699 career games, he averaged 14.4 ppg, 9.4 rpg and set the dubious record for most times fouling out of an NBA game (127). Mikkelsen was selected to six All-Star teams (11 ppg, 9 rpg AS Game average), was named All-NBA Second Team four times and averaged a double-double four times. Rounding out a fantastic PF corps is the man currently at the “4” for the Lakers, Pau Gasol. In 173 regular season games as a Laker, Pau has put up 18.7 ppg, 10 rpg, 3.5 apg and 1.4 bpg. Additionally, he’s been named an All-Star each of his two full seasons in L.A. and has been the inside catalyst for three consecutive Finals appearances and a pair of championships. Gasol took a good amount of heat after a tough initiation to the NBA Finals in 2008. That postseason he averaged 16.9- 9.3- 4 and was pushed around by the Celtics’ front line. However, Pau ensured that the criticism was short-lived. In each of the two title runs that have followed, he’s not only improved his scoring and rebounding averages, but has changed his on-court demeanor, which now includes a certain edge and swagger that had previously been lacking. Never was this more evident than in Game 7 of the 2010 Finals when, against the team that tormented him two years earlier, Gasol exorcized his postseason demons. He scored 19 points (nine in the fourth quarter), grabbed 18 rebounds and had a huge blocked shot against Paul Pierce, which he followed up with a clutch, contested layup with 1:30 remaining to give the Lakers a 76-70 lead. He’s got his work cut out for him if he’s ever going to usurp Elgin Baylor atop this list. However, Pau Gasol’s exceptional productivity and skill set, along with an outstanding record of team success, have him well-positioned to climb this list in the coming years. Certain positions in sports carry with them a mythical legacy of greatness. Centerfielder for the New York Yankees, quarterback for the Dallas Cowboys, middle linebacker for Chicago Bears, striker for a Brazilian World Cup squad… you get the picture. “Center for the Lakers” is at or near the top of that list. Consider the following: over the past six decades, four of the 10 greatest centers of all time have played at least 339 games for the Lakers, combining for more than 55,000 points and 25,000 rebounds, and playing a central role in 14 of the franchise’s 16 championships. How competitive a group is this? With averages of 17.7 ppg and 19.2 rpg, four All-Star selections, a pair of 18+ ppg, 20+ rpg seasons and a key role in the first championship of the Los Angeles era, Wilt Chamberlain comes in a distant fourth! Next up, a pair of legendary big men with similar on-court resumes and an unlikely connection off the floor. First up, George Mikan, who anchored the Lakers’ first dynasty in Minneapolis. In seven seasons, Mikan was named All-NBA First Team six times, earned four All-Star selections (the All-Star Game didn’t exist until his third season), won the 1953 All-Star MVP award and led the Lakers to six championships (one in the NBL in 1948 as well). Had the league MVP award existed prior to his final season, he probably would have racked up a couple of those as well. Big men have dominated the NBA for most of the last 60 years. George Mikan was the original. Mikan was the first superstar in the history of professional basketball and played a major role in the growth of the NBA’s popularity and credibility. He scored 11,764 points in his career and retired as the league’s all-time leading scorer. Mikan was inducted into the Basketball Hall of Fame in 1959. In his prime, Mikan dominated the NBA. However, his impact extended beyond his own on-court play and changed the way the game itself was played. In order to curb Mikan’s inside dominance, the NBA widened the lane from 6’ to 12’ (this is actually called "The Mikan Rule") and outlawed defensive goaltending. He was also indirectly responsible for the introduction of the shot clock. During a game in 1950-51, the Fort Wayne Pistons took a 19–18 lead (Mikan had 15 of the Lakers’ 18 points) and proceeded to simply pass the ball around without making any attempt to score. With no shot clock to force a shot attempt, the score remained 19–18. This is the lowest-scoring NBA game of all time. Four year later, the shot clock was introduced to ensure that there would not be a repeat of the embarrassing episode. In 439 games as a Laker, Mikan averaged 23.1 ppg and 13.4 rpg (in 311 games in which rebounding stats were kept). Mikan averaged 18+ ppg in each of his first six seasons (27+ each of his first three), and grabbed 14+ rpg in four straight seasons (rebounds were not tracked his first two seasons). Mikan was also an excellent playoff performer, averaging 23 ppg and 11 rpg in 60 career postseason games. In the Lakers’ 1949-50 title run (his third, but the first for which there are stats), Mikan averaged 31.3 ppg. Beginning in 1951-52, the Lakers embarked on the second three-peat in franchise history, their first in the NBA (the first was in the NBL, BAA and NBA). Mikan led the way with 23.6 ppg and 15.9 rpg in 13 postseason games. In those three triumphant postseason runs, Mikan averaged no worse than 19.4 ppg and 13.2 rpg. Following his retirement, Mikan battled diabetes and kidney disease, which led to the amputation of his right leg. Late in his life, his medical insurance was cut, leaving the legend in dire financial straights. He spent his final days fighting the NBA and the Players' Union to secure larger pensions (currently just $1,700/month) for pre-1965 retirees. After a protracted battle against disease and five years of dialysis, Mikan died in Scottsdale, AZ on June 1, 2005. In the aftermath of his passing, and in light of his financial woes, another Laker great, Shaquille O'Neal, offered to pay for his funeral, saying that "Without number 99 [Mikan], there is no me." Beginning in 1996-97, Shaquille O’Neal spent eight seasons with the Lakers. It was during this stretch that he cemented his legacy as the most physically dominant big man of his era. He averaged at least 26 ppg in each of first seven seasons, never shot worse than 55.7% and was good for at least 10.7 rpg every year he was a Laker. At his best, Shaq was totally unguardable. Watching an opposing big- any opposing big man- trying to defend a motivated Shaquille O’Neal inspired not the thrill of competition, but a feeling of pity for the condemned. In his three championship seasons with the Lakers, he averaged 27.2- 10.7 or better, including a career-best and league-leading 29.7 ppg, 13.6 rpg, 3.8 apg and 3 bpg in his devastating 1999-2000 MVP season. He followed that season up with a 28.7- 12.7- 3.7 the following year, finishing a close second Allen Iverson for league MVP. Shaq earned seven All-Star selections as a Laker (there was no AS Game in 1999), won a pair of All-Star MVPs (2000 and 2004) and was named First Team All-NBA seven times (and Second Team once). He also reached his defensive peak while in L.A., earning three selections to the All-Defensive Second Team. And he was even better in the postseason. In his first two championship runs with the Lakers, Shaq averaged a combined 30.6 ppg and 15.4 rpg. The following year, he “slipped” to 28.5 ppg and 12.6 rpg. And when he could smell the ring, he would raise his game to new heights. In 15 Finals games between 2000 and 2002, Shaq averaged 35.9 ppg and 14.6 rpg, with four 20-20 games and three 40-20s. In Game 2 of the 2001 Finals, he put up maybe the best game of his career. That year, the Lakers swept their way into the Finals, only to fall in Game 1 to an awesome 55-point performance from Allen Iverson awesome. In Game 2, Shaq made sure that the Lakers righted the ship, with 28 points, 20 rebounds, nine assists and eight blocked shots in a 98-89 win. However, as dominant and gifted a player as he was, Shaq consistently attracted questions about his work ethic with and conditioning. That he got a great deal out of his talent is irrefutable, but for a monstrous force of nature like Shaquille O’Neal to have never averaged 30 ppg or 14 rpg in a season is a bit ridiculous. For all of his greatness, Shaquille O’Neal is something of an underachiever. Sure, with averages of 27 ppg and 11.8 rpg (in 514 games), it seems like a silly statement to make. However, if you look at the top 15 players in NBA history, you’d be hard-pressed to find someone less dedicated to maximizing his physical gifts. With that we arrive at the final destination of this 29-part series, Kareem Abdul-Jabbar. The Captain. Thanks to his famous ability to “swing left, shoot right” (or “swing right, shoot left”, as he was ambidextrous with the hook) Kareem was able to become one of the three greatest players in NBA history and was able to remain a major factor at the offensive end until he was nearly 40 years old. His unblockable (in part because he’s a legit 7’2”), ambidextrous sky hook, outstanding footwork and incredible passing ability (he and Bill Walton are the two best passing big men ever) enabled Kareem to become one of the three best players in NBA history. And he accomplished much of this as a Laker. 14 seasons, 24,176 points, 10,279 rebounds, 3,652 assists, five championships (Finals MVP in 1985), three MVPs, 13 All-Star selections (apparently 25.8- 12.8 was considered subpar in 1978), six All-NBA First Team selections, four All-NBA Second Team nods, three All-Defensive First Team selections and four All-Defensive Second Team selections. Karem Abdul-Jabbar peaked as an individual force in the middle in his six-year run with the Milwaukee Bucks, prior to being traded to Los Angeles. However, based solely on his time with the Lakers, beginning at age 28, Kareem would still be one of the five or six greatest players in NBA history. Kareem was bridged the gap between West, Elgin and Wilt and the arrival of Magic. His early days with the Lakers saw Kareem put up some huge numbers and, with some help from an aging Gail Goodrich and a young Jamaal Wilkes, keep the Lakers relevant in a period of relative mediocrity for the franchise. His first season with the Lakers was outstanding, as he averaged 27.7 ppg (second in the NBA), 16.9 rpg and 4.1 bpg (led the league in both) and captured his fourth MVP award His 1,111 defensive rebounds in 1975-76 remains the NBA’s single-season record (defensive rebounds weren’t recorded until 1973-74). Also, in 1975-76, Kareem became the last player to record 4,000+ PRA (Points + Rebounds + Assists). Kareem was outstanding the following year as well, as he averaged 26.2 ppg, 13.3 rpg, 3.2 bpg, won another MVP award (his fifth in seven years) and returned the Lakers to the postseason after a one-year absence. In the 1980s, teamed with Magic, Worthy, Wilkes, Nixon and Scott, Kareem’s Lakers teams of the 1980s made eight trips to the Finals, winning five NBA titles. Individually, Kareem was not the same dominant force he’d been in the 1970s, he was exceptionally durable (76+ games played every year until age 40) and remained very productive, averaging 17.5 ppg and 6.7 rpg for the 1986-87 champions at age 39. In June 1989, after 20 NBA seasons and a “retirement tour” during the 1988-89 season, Kareem Abdul-Jabbar announced his retirement. He remains the NBA’s all-time leading NBA scorer (38,387 points) and is third in rebounds (17,440). In NBA history, only Robert Parish has played more than Kareem’s 20 seasons and 1,560 games. He is also the third all-time in blocks shots with 3,189, which is particularly impressive given that blocks were not recorded until the fourth year of his career. That’s it! This series is in the refrigerator! The door is closed, the lights are out, the eggs are coolin’, the butter’s gettin’ hard and the Jello’s jigglin’! You didn’t think I’d forgotten him, did you?